and Dec. 21, 2012 is a dark day on the calendar. 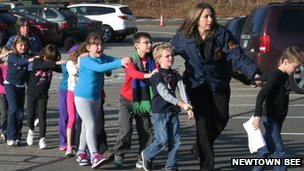 As news about the Connecticut school shooting emerges, it’s important to not only grieve with the families of victims, but also to realize that at the heart of these acts are invisible demonic forces. These are secret enemies that work for Satan and use humans to do his evil work. The shooter is what is called a "sleeper" - a pre-programmed, demonized, schizophrenic assassin. If he had lived, he might not have even remembered what he did. The saddest part of the school shooting story is that due to massive clandestine efforts on the part of Satanists over the last 50 years, all hell is literally ready to break loose on our world, especially in the US, and most people do not even know it! So expect more shootings to come - not only in schools but in churches. Russ Dizdar, who is involved in front line spiritual warfare, including exorcism and helping law enforcement officials deal with victims of satanic ritual abuse, says that there are millions of these guys pre-programmed to do such things at a moment’s notice. The things that have been done secretly for 50 years are now coming into the open. The US alone has over 5 million multiple personality disorder cases, and according to Russ, around 95% of them are victims of Satanic ritual abuse and are trained to kill. This is part of the Anti-Christ's army that is being prepared for his arrival, and they are ready to pounce upon us! For brief introduction, see the Secrets of the Black Awakening. Also, Russ recently gave a good three-hour interview on the subject on the December 13th episode of the Hagmann & Hagmann Report. Click here to listen to 22 minutes of excerpts. For deeper study, see Shatter the Darkness. On Dec. 21, 2012, Satanists and New Agers will be assembling in key places all over the world to invite spirits into our realm. Many of those people involved talk about the "ascension", quartz crystal skulls, "rise in human consciousness", etc. They may not know it, but they are actually talking about evil spirits, aka "demons", coming into the world and into people. Thus, the rituals taking place on December 21, 2012 in South America, Stonehenge and other places around the globe are actually designed to bring in demons. They've been happening more and more in recent years, and they are breaking down the hedges that God placed in our world to protect us. It appears that whenever WW3 starts in the Mid-east and/or the power grid goes down and/or the USD collapses, demon-possessed people like the school shooters will be coming out of the woodwork to do blood sacrifices on a grand scale. They are in the military, police, and other areas. They have split personalities, and some are MK ultra (see Jesse Ventura's documentary on Manchurian Candidates & MK ULTRA), so they often don’t even know what they do. They are also sleepers, people ready to come to action upon a short notice. Christians in the US have been targeted and millions will be martyred after the guns are confiscated. It’s a historic pattern: silence of church leaders on moral matters, compromise in the church, gun confiscation, persecution, martyrdom. However, this time the stage is set for even greater slaughter. Timing is unknown, but it will happen, and Jesus said that when these things happen, many people will simply have heart attacks when they see it (Luke 21:26). To send them out against believers of Jesus Christ or whomever they perceive as an enemy; this can include curses on people's finances, disease or sickness; this is nothing new - Balak tried to get Balaam to curse Israel in Num. 22-24. Although most people are distracted by bread and circus news and ball games, Satanists all over the world are opening up portals and inviting demons in like gangbusters. They are inviting them in through portals / star gates and places like Stonehenge, where thousands of blood sacrifices were made many years ago. 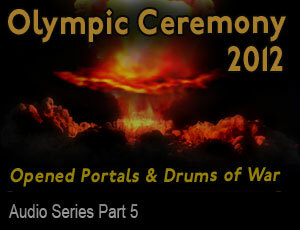 They invited them in at the Olympics opening ceremony (see Nathan Leal's research on what really happened at the 2012 Olympic Opening Ceremony). Although a currency collapse is nothing new, it has never happened to the world reserve currency. When the USD collapses and/or the power grid goes down and riots and civil war ensue, it will be important to understand and identify the spiritual reality behind the visible chaos. Timing is unknown, and the length of time for the process to unfold is unknown, but history shows that a collapse must come, and preparations have been underway for martial law and large scale assassinations for a long time. See Doeg the Edomite and UN Peacekeepers in the US and Secret FEMA Plan To Use Pastors as Pacifiers in Preparation For Martial Law or listen to this. Russ believes that when the power grid goes down, we could see 10,000 sleeper assasins go into action all over the US at once, as well as in other countries. They are preprogrammed and pre-positioned. From God's perspective, it's judgment on the world for rejecting Him, and it's also His way of purifying His people. From the perspective of the Lucifereans, it is part of a plan to take down the existing US government and culture and subdue it under the New World Order, a global government under a global dictator (see 2 Thes. 2 and Rev. 13). History shows that in order to carry out a coup, the usurpers must take out all the leadership of the existing government. This includes, political, military and religious figures. Since Christians have the capacity to possess the most spiritual power, serious followers of Jesus have already been targeted. Abide in Christ Jesus (John 15:5) by spending time daily to meditate on Scripture and pray and by obeying the all commands in the Bible. Cover yourself with the blood of Jesus (Rev. 12:11). Understand the times (1 Chr. 12:32); today, this can be done by following Christian alternate media sources like those listed below. Store up physical items for survival (Mt. 25:1-13, Heb. 11:7). Do not expect to be raptured out of here before all this happens (Luke 21:12-19). You may be setting yourself up for horrific disappointment. See Tribulation Contingency Plan. This article is in the public domain. Feel free to copy it and re-use it if you believe it is true. This page was last updated on 25 September 2014 .